I've lost count of all the messages, tweets, and emails that I've gotten - through the years - from my friends and readers on how and where they can have the shattered glass screen of their iPhones fixed or replaced. As a gadget enthusiast and a big Apple fan, my heart breaks a little whenever I hear news of a damaged iPhone. But accidents do happen and these are realities we have to accept. Good thing there now accessories like the Rhino Shield Shatter-Proof Screen Guard that help protect our beloved gadget investments from the knocks and bumps of daily use. Many flagship smartphones these days - including the more recent iPhones - feature scratch-resistant and supposedly ultra-durable glass faces. But these touchscreens are hardly shatter-proof. One drop on a concrete floor from a height of one meter is all it takes to break them. "Protecting mobile devices have been a big challenge. There are many great cases that already tackle some of the problems with outstanding solutions. We have seen some protection at insane levels, i.e. cases that enable smart devices to survive when a car runs over it. However, there are very few products that attempt to protect the most vulnerable part of the phone, its screen. Therefore we were determined to design and engineer a screen protector that will be resistant to impacts. After a year of relentless research and development, the end product is Rhino Shield," shared Evolutive Labs - the company behind this innovative screen protector that was first featured on Kickstarter. 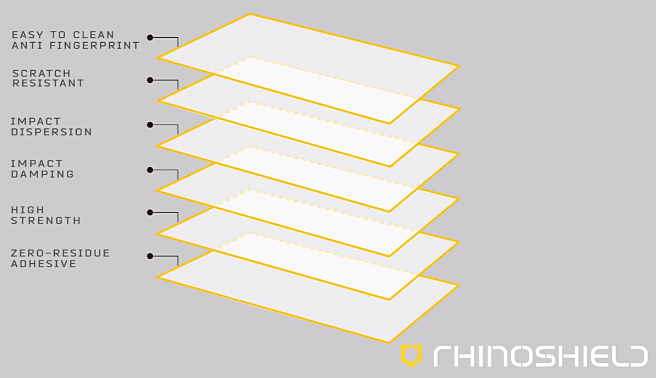 Measuring only 0.029 cm thin, Rhino Shield Screen Protector is actually made up of six layers -- each having a specific purpose or function. The outer parts give it a smudge-and-scratch-resistant finish while the ones in the middle are for impact dispersion and damping to keep the glass together in the event of a direct hit by a solid object or a 'face-down drop'. This GIF shows a test performed by Evolutive Labs where they dropped a ball bearing weighing 115 grams on a sheet of Gorilla Glass. Unprotected, the screen was shattered to pieces upon impact. But with Rhino Shield on top of it, the sheet survives unscathed. 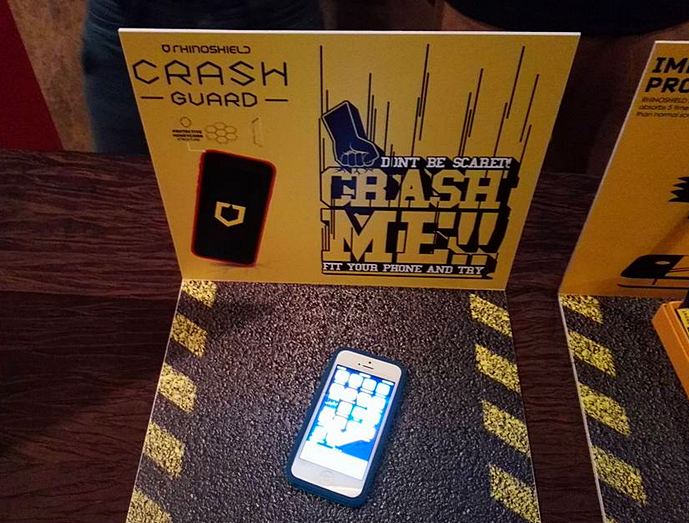 Now, let me show you an actual, unscripted crash test on a real, working iPhone protected by Rhino Shield. I recorded this video during this launch of this shatter-proof screen guard in Resorts World Manila a couple of months back. Amazing, eh? Heck, I was so impressed by the demo that I now feel compelled to recommend Rhino Shield to all iPhone owners. The product currently sells for Php 1,360 at LazadaPH (via Mac Power Corporation, Rhino Shield's official distributor in the Philippines), making it one of the most expensive screen guards in their catalog. But hey, I think that's a small price to pay if you want to give the screen of your Php 40,000 smartphone's screen that much-needed daily impact protection.